Whether you are planning for the ghosts and ghouls or for a Fall Festival, Halloween is a fun holiday for the young and old alike. Haunted houses, trick-or-treating, and bobbing for apples make the season exciting and it's a great opportunity to throw a party. Pumpkins abound during the fall and many people like to carve jack-o-lanterns. You don't have to throw out the insides of the pumpkin. You'll find some tips in this section about roasting the seeds and making a pumpkin pie from scratch. 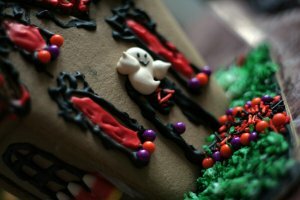 If you are hosting a Halloween party, you'll find some fun recipes to create some spooky treats from otherwise ordinary food. The following articles are available for the 'Halloween' topic. Click the article''s title (shown in bold) to see the associated article. Around autumn you carve pumpkins and you are always left with the seeds. What do you do with them? One way to deal with pumpkin seeds is to cook them, creating a tasty fall treat that all will enjoy! All your little Halloween ghosts and goblins undoubtedly come with not-so-little appetites. Here are some great ideas you can use to whip up some Halloween goodies in no time. It's always a great day when you come home to the smell of freshly baked pumpkin bread. Here's a great pumpkin bread recipe that will succeed in making your autumn unforgettable.